Step on one end of the band, and ensure there is enough tension in the band to extend your hand up straight. Bend your elbow so it is pointing up, you can use your other hand to support it up if need be. Begin extending your arm up and lower for one repetition. There should be enough tension in the band that it is challenging, but not too much that you cannot complete 8 reps easily. Be sure to breath out on your extension (raising your arm up). Repeat 7 more times for a total of 8 cycles (beginners can do 4-6, advanced can do 8-10). 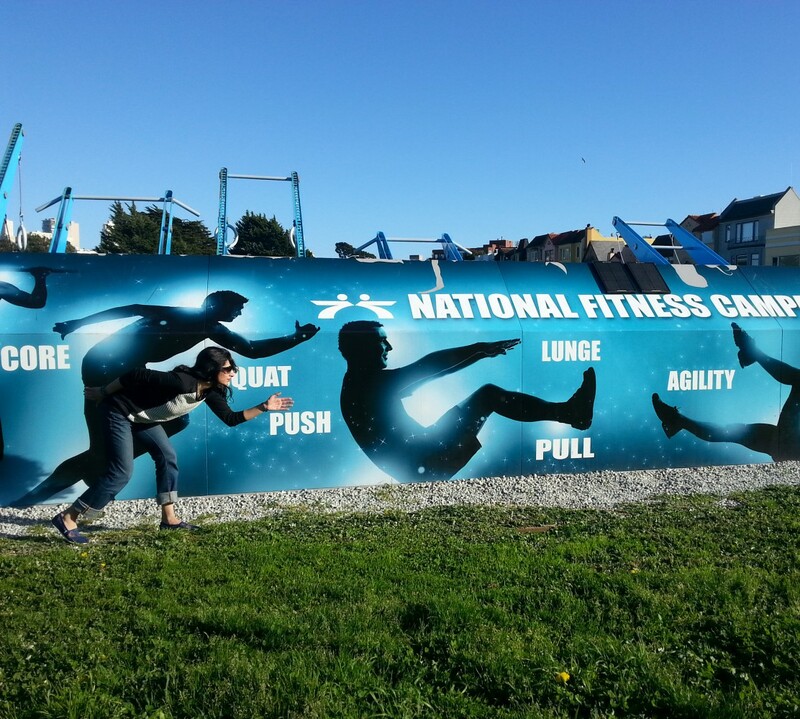 I’ve created bootcamps with tabata circuits, giving bootcampers the biggest bang for their buck. You can work multiple muscle groups with varying degrees of intensity. For example, after the jump rope tabata, you can move to an assortment of bodyweight exercises such as an air squat, a burpee, a mountain climber, crunches, even sprints! You can create a great circuit without any equipment! 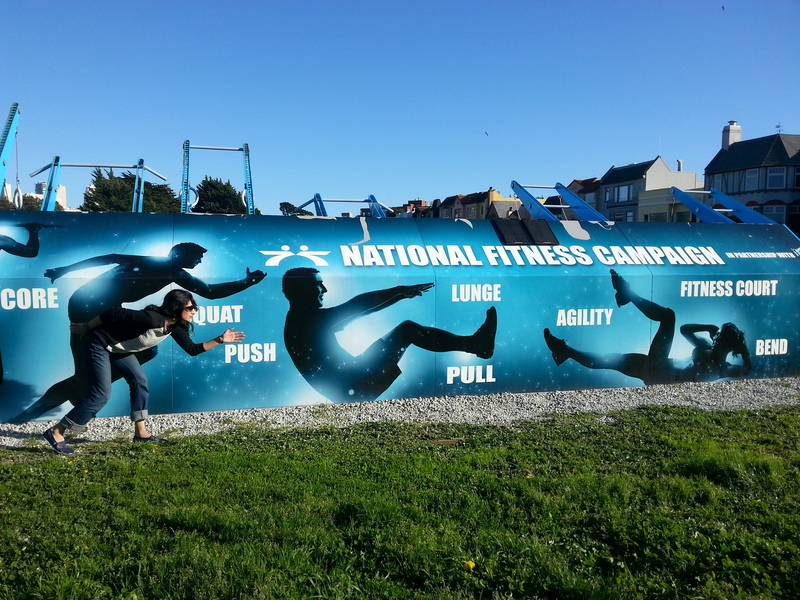 Here is a photo from an outdoor fitness park in San Francisco. Hopefully it will conjure up some ideas to get you started on your first Ramadan tabata! Go easy and slow if a tabata is new to you, keep in mind your fitness level and what you will be capable of while fasting. Why do I cramp on race day, and not the hundreds of miles I put on the pavement beforehand? What I have always loved about running is the competition. Against myself, not everyone else. I race to win, against myself. Around mile 8, I checked my Garmin and I knew I was going to beat my time from last year. So I asked myself, “Is this as fast as I can go right now?”, and kicked it up. My legs had other plans and my muscles weren’t having it. 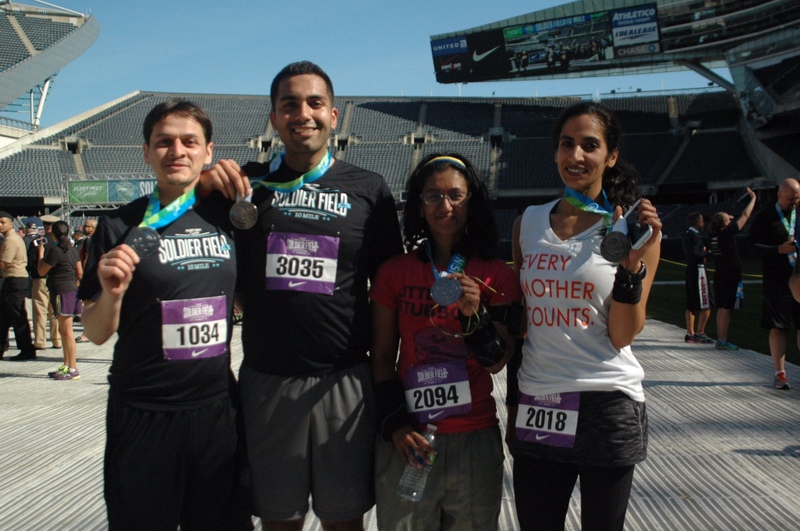 Muscle spasms, on both legs, down to my feet all the way through the finish line. Competition. It’s a nasty beast, but character building. Life changing. I crossed the finish line and swore I would NEVER do it again, but here I am now, fondly enjoying my finish line picture (yes I will purchase it), dreaming about what I could have done differently. Maybe the cramping and post-race first aid experience wasn’t all *that* bad? (Yea, it was). I haven’t posted in weeks! I’ve been busy training for my triathlon and making significant gains in the swim department. Recently, an article on body types caught my attention and I found the correlation between knowing your body type, exercise and diet to be very interesting. Do you know your body type? The media has us brainwashed to believe that the thin, white ideal for women, or tough, muscular and cut men are the standards of beauty. That anything else is a ‘work in progress’. Deep down we know not everyone has or wants to have a runway ready body, and most certainly we don’t find ourselves amidst these types in our everyday lives. We are inundated with ridiculous magazine covers with headlines such as ‘Get Kate Moss’ workout’ and that leads the woman to consider, ‘Ok, if I get her workout, then I have a greater chance in looking like her’. The poison seeps into the subconscious. The tagline they are noticeably excluding is, ‘only if you are also an ectomorph like Kate Moss’. So, the next time you catch yourself coveting someone else’s body, consider your own body type first. There are three body types for men and women and once you know what you are, you can be liberated from the thought of trying to fit into a mold that is simply unattainable, or that is not yours. They are: ectomorph, endomorph and mesomorph. Most people are a combination of two or more types. The ectomorph is the skinny, thin-framed individual with little fat. They are usually not athletic and have little or no muscle tone, which is why they are often referred to as ‘skinny fat’. Most supermodels are ectomorphs, which has unfortunately contributed to the thin, white ideal of women. Many ectomorphs can eat whatever they want as their body metabolizes food very quickly. Endomorphs, however, have more body fat, tend to be overweight, have a smoother, more round body and are bigger-boned (than ectomorphs). They have a slower metabolism and take longer to lose weight. Endomorphs are not the morning ‘go-getters’ and need a little prodding to be active. Don’t despair! Get a gym buddy or hire a personal trainer to help motivate you. Further, let this knowledge be the inspiration for the way you exercise and eat. Unfortunately we see large-framed, oversized women struggling to lose weight to fit into skinny jeans that are not designed for them. Mesomorphs are naturally active, athletic, and respond quickly to any weight training and are naturally lean and strong. They also gain fat easily when they are not active. Because they have broader, squarer shoulders, mesomorph women tend to have an hourglass figure, whereas men have a “V” or rectangle shape build. The purpose in knowing your body type(s) is to boost your self-esteem. Additionally, it is to understand the body’s mechanics. Ectomorph people may be under the impression they are ‘fit’ or ‘healthy’ because they don’t carry extra weight. This is often referred to as ‘skinny fat’, as they have no muscle tone. However, this can often lead to unhealthy binging and eating habits as they are under an illusion that they are otherwise healthy. 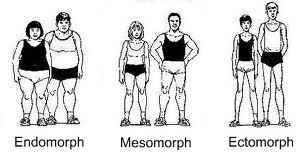 I am a combination of mesomorph and endomorph. I have a small-framed body but am (and always have been) very athletic. I have a quick metabolism and find it easy to gain muscle, and am freakishly strong. 🙂 Knowing my body type allows me to design workouts and maintain a healthy diet that is just right for me.